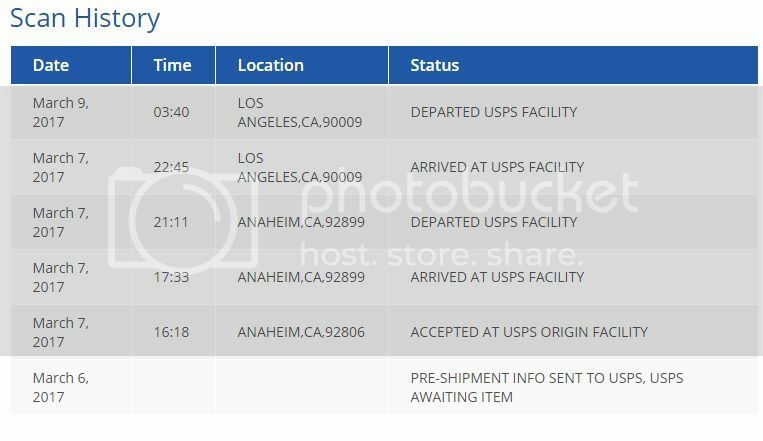 I have a parcel that is tracking with USPS that was scanned as departed USPS Facility in LA on the 9th March. I haven't seen it yet and am getting concerned it been lost as it is a Kennedy and I'd be devastated if it has gone AWOL. I'll be giving them a call on Monday but does anyone have an idea of how long they usually take from USA to AUS? My last parcel from the US a few weeks ago was Priority Mail International. It was scanned as departing Chicago, and then no more scans in either the US or here until it showed up on my doorstep. Lack of scans doesn't mean it's not moving. If yours is Priority Mail International and it hasn't arrived on Monday, then I'd be asking the sender to query it. It's possible it's already in Australia and at customs or, worse, Sunshine West. If it was sent as a First Class Package, then it could be a bit of a wait yet. Either way, I think it's too early to panic. Only going the other way, into the US. Spotty is being generous. Most often USPS does a pretty good job of it. Not great, but fast enough and reliable. Left coast is usually no problem. But they do have periods where they make Ozpost look like absolute superstars. They don't lose much, but 2-3 months for economy airmail is taking it a little too far. By the looks of that, I'd expect it's already left the US on the 9th and this is in Ozpost's domain. Most, if not all delays are usually a result of the receiving postal service, not the sending one. From my experience its 7-10 days from leaving LA to delivery unless it ends up in sunshine west. My guess would also be a nice summer holiday in sunshine west. My sonar squonker took 2.5 days to get from 'picked up' in Backass Alabama to 'cleared customs' here. It then took another week to find my suburban house. And I don't even live at 13 Grimauld Place! I might leave it a bit longer before I waste time on the phone to them. I get stuff sent over via them and it typically gets to Perth in 5 or 6 days, then customs are such caring chaps they want to look after it for me. there for a couple of weeks. Plus USPS do log stuff as having arrived before it actually has which doesn't help. good chance its been held up by the storms. tracking or they might be able to find out some more info for you.